Earlier this month, the governor of Michigan ordered the immediate end of a state sponsored program that provides free bottled water to residents of the toxic water laden community of Flint. The edict comes despite concerns from thousands of residents and the owner of the only African-American-owned business contracted to replace thousands of lead corroded pipes throughout the city. 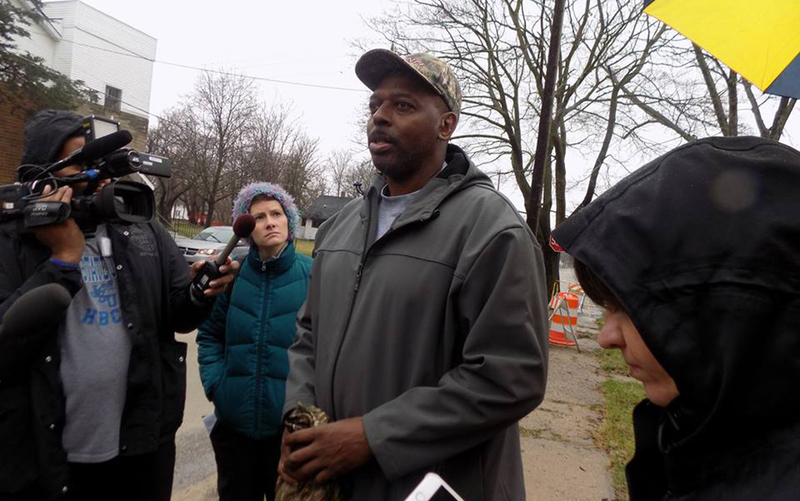 Jeff Grayer, co-owner and project manager of WT Stevens Construction?a minority and women owned business enterprise (MWBE) based in Flint, says only about half of the targeted 18,000 lead corroded water line pipes across the city have been replaced. ?People still have questions and concerns about the safety and cleanliness of the water since all of the contaminated residential pipes haven’t been replaced,? he says. WT Stevens Construction was the only African American owned and locally-based company to be awarded a multi-million dollar three-year contract to replace more than 18,000 lead corroded residential pipes throughout the city last year following a $97 million judgment against the city of Flint and the state of Michigan by a federal magistrate. Republican Governor Rick Snyder said the city water levels have been testing below the federal action level for lead and copper for nearly two years and the distribution of free bottled water to the more than 100,000 residents of Flint would be discontinued. The state pays about $22,000 a day to provide bottled water. In a letter last week to Flint Mayor Karen Weaver, Snyder said the state would now focus on ?health, education and economic development assistance needed to help move Flint forward.? The Flint, Michigan, water crisis started back in April 2014 after Michigan state officials and politicos ? including Snyder fast-tracked a measure to change the source of processing water from the highly-regulated Detroit Water and Sewage Department to the Flint River without properly treating it for lead, pollutants and other toxins. The cost-cutting measure saved the city hundreds of thousands of dollars, however, the scheme lead to thousands of residents becoming seriously ill. At least a dozen people died from an outbreak of Legionella—a pneumonia-like disease linked to contaminated water. In addition, claims of racism and discrimination abounded against city and state officials for not informing residents of the mostly minority and lower-income city about the hazardous and potentially deadly drinking water for nearly two years. As a result of the ignominy, dozens of lawsuits were filed against several state and local politicians, and city officials face criminal indictments. In a statement last week to the media, Flint Mayor Karen Weaver said the state should continue to pay for bottled water for residents until all lead and galvanized water service lines have been replaced. Weaver said she will pursue ?immediate legal options? to force state officials to continue to provide free bottled water to the city. Lastly, some community activists contend the city and state have fallen short of efforts to restore credibility and veracity to residents. ?The water system is not fully restored and the water is not safe to drink,? says Vicki Johnson-Lawrence, program director of Resiliency in Communities After Stress & Trauma (ReCast)–a community activist group that was formed shortly after Flint was declared a State of Emergency in December 2015 and the story made international headlines. Johnson-Lawrence says, ?I, along with thousands of other people in Flint, will not drink the water.? (TNJ contributing writer Glenn Townes was awarded a reporting fellowship from the Institute for Journalism & Natural Resources (IJNR) to cover the Flint (MI) water crisis.)???????????????????????????????????????????????? Can Chicago Tourism Overcome Image of Crime, Police Brutality?